Background: Retention mechanism of proteins in hydroxyapatite chromatography (HAC) was investigated by linear gradient elution experiments (LGE). 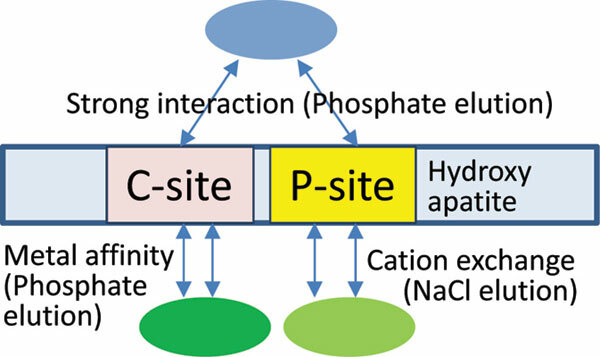 Materials and Methods: Several mobile phase (buffer) solution strategies and solutes were evaluated in order to probe the relative contributions of two adsorption sites of hydroxyapatite (HA) particles, C-site due to Ca (metal affinity) and P-site due to PO4 (cation-exchange). When P-site was blocked, two basic proteins, lysozyme (Lys) and ribonuclease A(RNase), were not retained whereas cytochrome C(Cyt C) and lactoferrin (LF) were retained and also retention of acidic proteins became stronger as the repulsion due to P-site was eliminated. The number of the binding site B values determined from LGE also increased, which also showed reduction of repulsion forces. Conclusion: The selectivity (retention) of four basic proteins (RNase, Lys, Cyt C, LF) in HAC was different from that in ion-exchange chromatography. Moreover, it was possible to tune the selectivity by using NaCl gradient. Keywords: Hydroxyapatite chromatography, linear gradient elution, protein retention, binding site, LGE, LF. Keywords:Hydroxyapatite chromatography, linear gradient elution, protein retention, binding site, LGE, LF. Abstract:Background: Retention mechanism of proteins in hydroxyapatite chromatography (HAC) was investigated by linear gradient elution experiments (LGE).